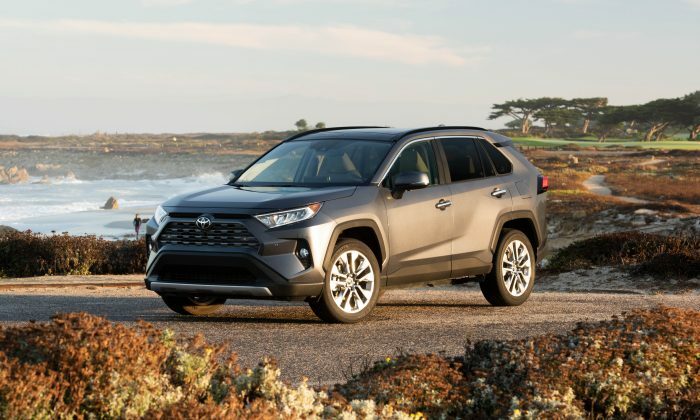 The RAV4 is Toyota’s entry in the compact crossover category, which is a vital segment that has been winning consumers over from family sedans in recent years. The 2018 RAV4 was a winner as far as sales number and customer satisfaction are concerned, but that didn’t stop Toyota from taking a real chance and redesigning the 2019 RAV4. This new RAV4 has a longer wheelbase and a wider stance, and it sits a little taller for a better outside view. Toyota says the 2019 RAV4 is also lighter, at 3,542 pounds, which contributes to more responsive handling. The non-hybrid RAV4 comes in five trims: LE, XLE, XLE Premium, Adventure, and Limited. I had the opportunity to test drive all five trims. The front doors are wide. Inside, you will find a cabin that is stylish and trendy in nature, but also practical. Knobs and buttons are on both sides of the dash, while the infotainment screen sits high on the dash. However, it did take too much time for Entune to load, and it is still slow to use after it has loaded. The cabin is loaded with smart technologies. 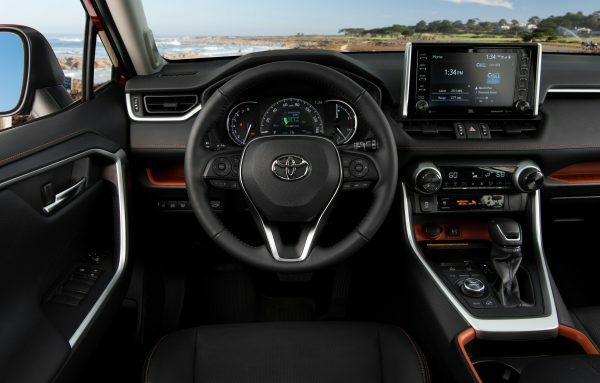 My favorite feature was the Toyota Remote Connect feature, which allows you to locate your vehicle, lock or unlock doors, and start the engine, all from your Apple iOS or Android smart devices. The new RAV4 introduces its first camera-mounted digital rear-view mirror. A wide-angle camera is mounted high up at the back of the vehicle, and it feeds a wider view into the rear-view mirror at the flip of a switch. It is a standard feature on the Limited trim but is also available as a part of an option package for the XLE Premium and Adventure models. The RAV4 bucket seats are most comfortable, wrapped in fine-quality materials. There is plenty of space in the back for two adults to settle comfortably, in the 60/40-split reclining fold-flat rear seat with center armrest and cup holders. The absolute only issue I had was the road noise. It seemed more pronounced than in previous models. A dual-zone automatic climate control system and a height-adjustable power liftgate are found on all but the LE trim. Although the power tilt/slide moonroof with auto open/close is part of an optional package, I would recommend it. The 2019 RAV4 has a character-defining powertrain. The 2.5-liter, four-cylinder Dynamic Force Engine is capable of producing 203 horsepower at 6,600 rpm and 184 lb.-ft. of torque at 5,000 rpm, and it is paired with a direct shift eight-speed electronically controlled automatic transmission. RAV4 is available with AWD, which bundles Multi-terrain Select to better tackle challenging driving surfaces. With the Adventure trims, you have a 3,500-pound towing capacity, while all other models can tow up to 1,500 pounds. Fuel economy is rated at 25/33/28 mpg city/highway/combined for the AWD models, and the fuel tank can hold 14.5 gallons. You ride on 17-inch or 19-inch wheels, with varying spoke configurations depending on trim selection. LED daytime running lights, tail lights, and stop lights fit well with the black fender flares. Sharp creases promote a muscular image, capable of going wherever the next adventure may take you. Although the 2018 RAV4 was exceptional and well received, I believe the 2019 RAV4 will do even better. Pricing starts at $25,500 for the FWD LE, and goes up to $34,900 for the AWD Limited, making it highly competitive against major rivals such as the Honda CR-V.